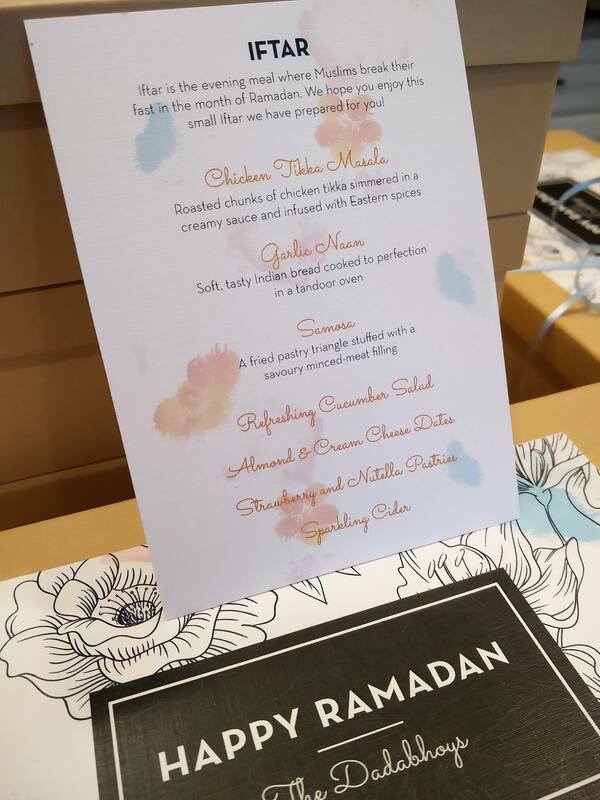 Ramadan is such an incredibly special time for all Muslims. How beautiful is it to be able to share that with your neighbors? We recently came across sister Lubna Dadabhoy who did just that, and in the most beautiful way. 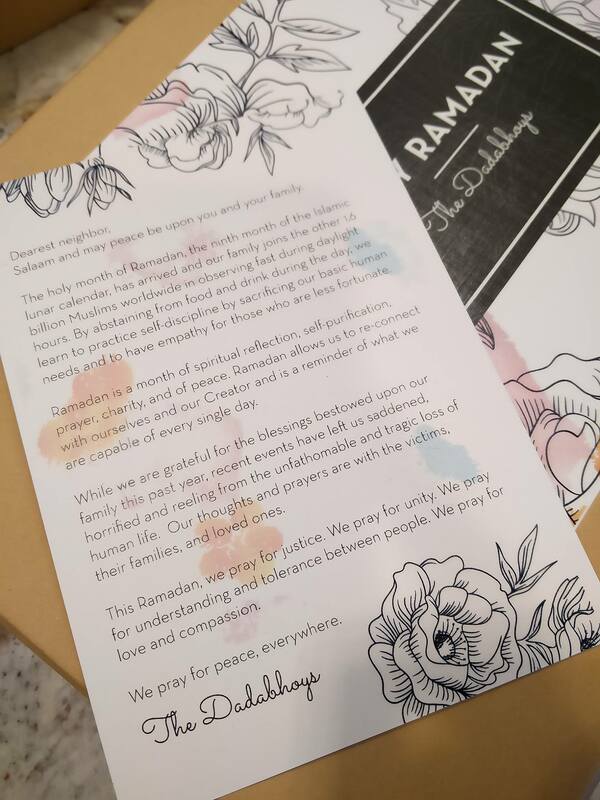 With her permission, we're excited to share photos, stationary you can edit and print, as well as some questions and answers, all of which she generously provided. Check it out below! 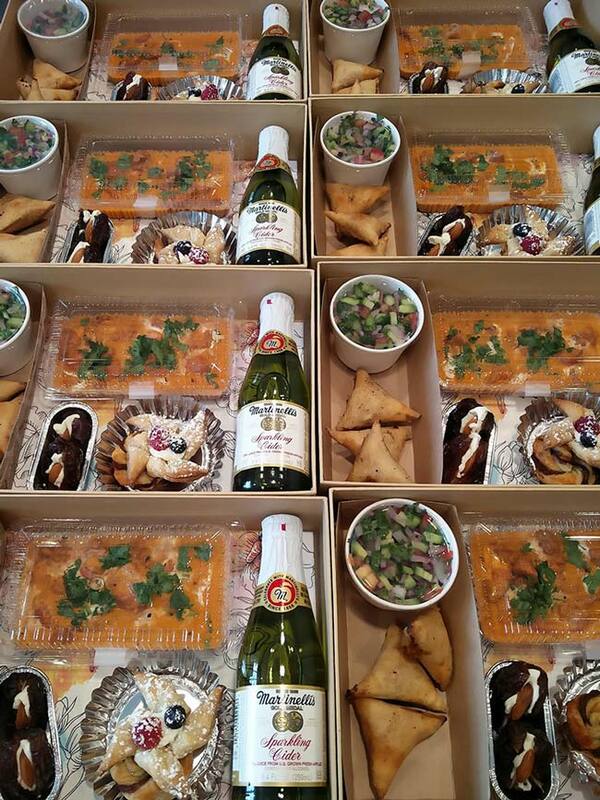 "Alhamdulilah, *finally* got a chance to make our traditional Iftar for our neighbors! With 4 small boys running around at home (X_X), I kept the cooking minimal and tried to fancy it up with the packaging. 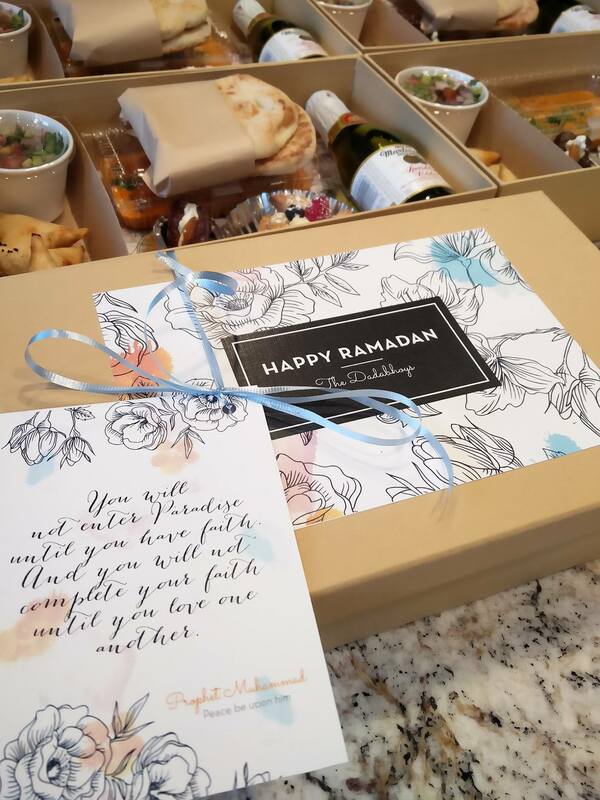 They had a blast delivering the boxes to all 12 neighbors and wishing them a Happy Ramadan! Since most are the same neighbors as last year, I didn't want to include the same note card, so I switched that up this year a little. I think it's important that our neighbors, whom we see in person every day and are not on our Facebook, are aware of how the recent tragedies affected us." Download all of Lubna's stationary here. All you have to do is open the files in Adobe Reader/Acrobat to edit the text and then print your final copy. 1) Where are the boxes and compartments from? The box and the little compartments inside are from a store called Daiso - it is a Japanese version of the Dollar Tree and they have the best and cutest things! Their selection is much greater in person, but the gift boxes I used, along with other color/pattern options, are here. 2) How much did it cost? The supplies to make all 12 boxes came out to about $25 (not including any grocery item). The main gift box was $1.50 USD and most of the little containers and packages came in packs of 12. A few came in packs of three or four so I had to purchase accordingly. I am not a great Indian food cook. Please give me anything else to make - American, Mexican, Italian, Thai - and I will be happy! One of the few things I know how to make is Chicken Tikka (and versions of it), hence the reason Chicken Tikka was the star on my platters for 2 years, haha! That and I think the general public enjoy it, too. (hopefully). 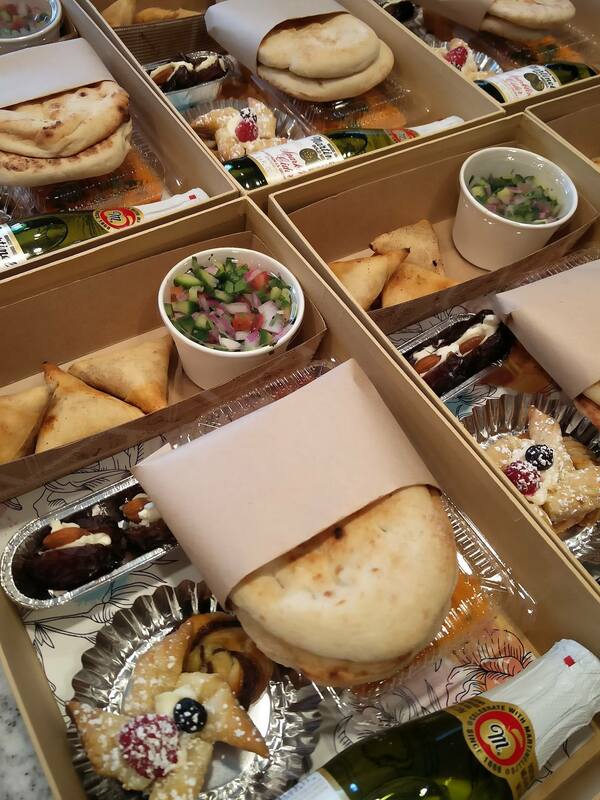 The keema samoosas were purchased from a lovely lady who makes them from home. I purchased the garlic naan from Trader Joe's and just wrapped them with parchment for a finishing touch. The salad is kachumber (?) and the pastries are windmill cream cheese with berries and nutella spirals. The dates were cream cheese stuffed with almonds - I didn't have a chance to make my good friend Fiona Motala-Darsot's delicious recipe; I will have to make hers next time! We finished off with a miniature bottle of sparkling cider which can be found at Smart & Final or other major grocery chain. Despite all of your wonderful comments, we are our own worst critic - which I really need to let up on! I didn't have enough carved lemon pieces or mini ketchup containers to nestle in next to the samoosas. 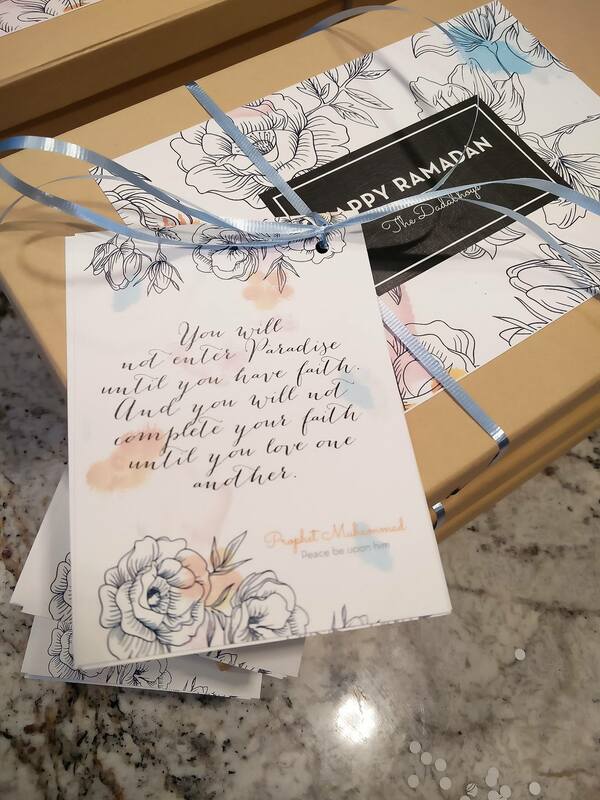 I was racing against the clock to have everything packaged and delivered with enough time for our family to sit together before our own iftaar. I also didn't have time to add in the fork/spoon/packaged wet cloth/napkin next to the beverage. Khayr alhamdulilah, the only one who will notice is me and it is a way to make notes for the future! I always say: we eat with our eyes first! 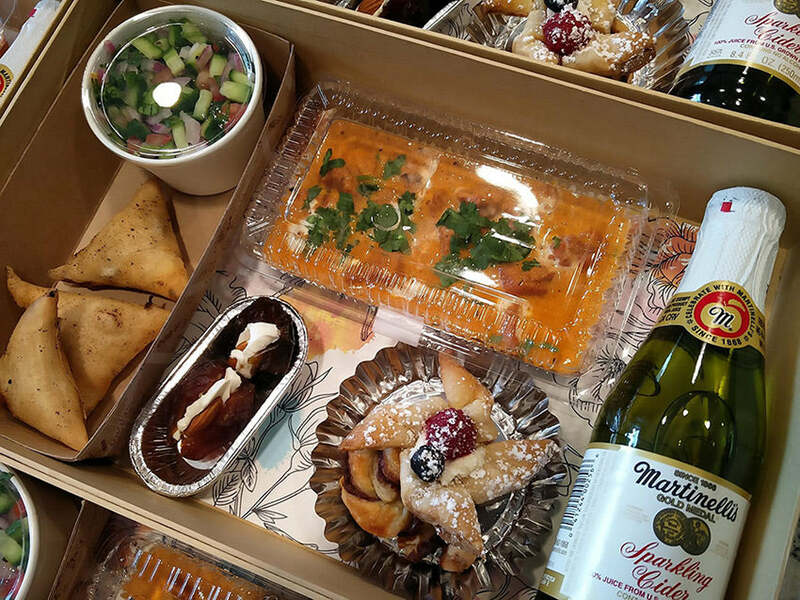 It doesn't matter if it is a box like mine or if you can't/don't want to cook (no judgement from me at all!) - a ribbon here, a freshly-cut garden rose there, a pretty little note with a matching paper plate goes a long way in taking something to the next level. 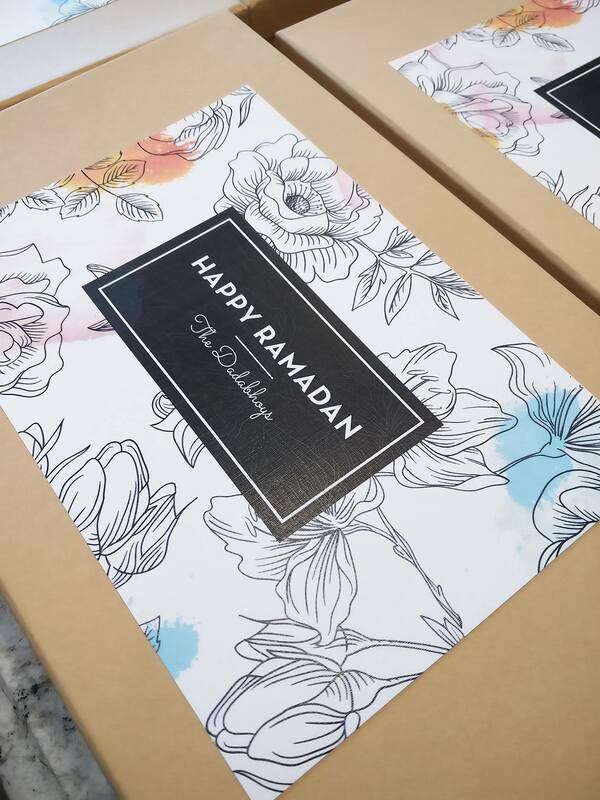 I, myself, last year I think, didn't have enough time to go all out, so I baked one type of cookie and packaged it in small boxes (from Daiso) with a little Happy Ramadan card on top and that was it. Our wonderful neighbors still appreciated it and enjoyed it alhamdulilah. The effort is what matters and that's all that counts.